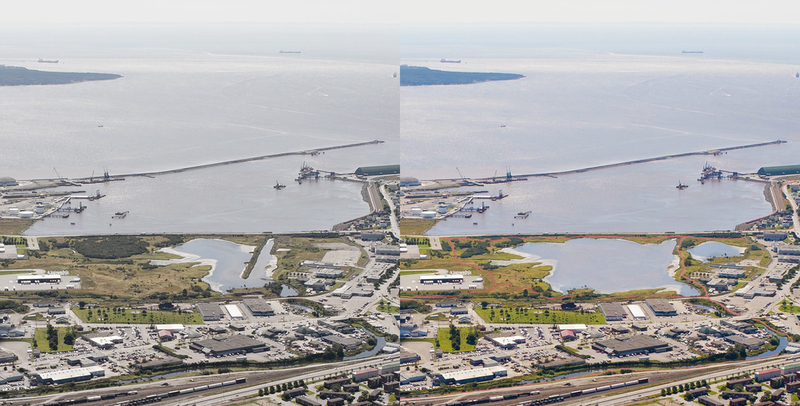 The Marsh Creek Restoration Initiative is ACAP Saint John's flagship project and continues to be the most ambitious sustainable development proposal in Atlantic Canada's history. With improvements spanning from aquatic habitat restorations and wetland remediation, to reductions in localized flood severity and improvements to community transportation links, this massive re-thinking of New Brunswick's largest urban watershed promises to redefine Saint John for a new generation. Marsh Creek forms the spine of a 4,200+ hectare watershed Saint John, New Brunswick, that drains directly into the Bay of Fundy. The watershed, which served as a valuable natural asset for early settlers, became an internationally recognized environmental concern when untreated sewage was being discharged into the streams. The creek is also subject to extreme flooding which is related to commercial and residential developments in the area formerly called The Great Marsh. Since 2007 ACAP Saint John has championed an ambitious vision of a restored Marsh Creek. The project, titled the Marsh Creek Restoration Initiative, was founded on the announcement that the Harbour Cleanup infrastructure project would eliminate all untreated wastewater discharges in Saint John. Harbour Cleanup wrapped up in 2014 which opens up the opportunity to act on the Marsh Creek Restoration Initiative’s vision. Read more about the Marsh Creek Restoration Initiative and Marsh Creek Watershed Management Plans by browsing through our reports archive here. Without Borders is a regional greenway and protected areas initiative for Greater Saint John. It aims to help local governments to share information and resources in working towards improving environmental protection, adapting to climate change, and increasing the quality of life and well-being of residents. The natural environment does not recognize the governance boundaries by which we organize land use and the actions and developments that occur within one jurisdiction inevitably have an effect on neighbouring jurisdictions. This is most obvious with water where the quality and quantity of water downstream is affected by upstream activities. It also applies to habitats and wildlife corridors where biota, such as wildlife, moves between governance boundaries. This project explores the potential benefits of a regional greenway and protected area network and how this concept can be applied within Greater Saint John to benefit the long-term sustainability of the region’s natural environment and communities. Do you support the notion of a regional greenway and protected area? Let us know here. Tin Can Beach has long been frequented by residents living nearby and it is the last remaining coastline with natural features on the Peninsula. It is also one of the last remaining areas along the Saint John Harbour where residents have public access to the coast. ACAP Saint John has been collaborating with the City of Saint John, community members, and corporate partners to revitalize Tin Can Beach in Saint John’s South End. The South End is considered a ‘priority neighbourhood’ and is one of the densest neighbourhoods in the Province, as such, ensuring opportunities for these residents to participate in the social, cultural and environmental attributes of the city, especially those within walking distance of residential areas, should be an important consideration for any plan for the area. ACAP Saint John has been using a placemaking approach for revitalization. This approach seeks to enhance a community asset in order to increase citizens’ happiness and wellbeing. It embraces input from the community to apply small design interventions to enhance an area based on the needs and desires of the community. Tin Can Beach was identified as an asset due to its access to the Harbour and natural coastal features in an urban priority neighbourhood. For those who haven’t had the opportunity to visit this area, we strongly recommend you do so, the natural capital of the area is without rival. Take a look at the vantage points and scenery it has to offer. This world class view is under-valued and exists right under our noses. The Tin Can Beach area is truly worth conserving and enhancing for future generations. With very little imagination, you can envision how Harbour Passage could be extended and Tin Can Beach enhanced for public use. Extending Harbour Passage to Tin Can Beach was a common comment that ACAP Saint John heard during the public consultation process. In this potential design, the right-of-way to Tin Can Beach (via the extension of Sydney Street) has been lined with trees and an ecological buffer, and surfaced in the familiar Cranberry Trail format of Harbour Passage. Tin Can Beach itself has been enhanced with a similar lookout to what is currently in place on Chelsey Drive. There is also the possibility of having a boardwalk to increase public enjoyment. Interpretative panels could be installed to promote the historical significance of this area, to showcase the various aspects of the working port, and to highlight the fish and wildlife that frequent this area.